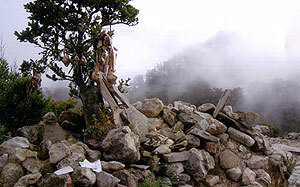 Mount Argopuro is very suitable for people who like the challenge. A difficult area with very step high side and sloping valley, there is also nature mantraps along the way. Those are challenge to get a deep impression. Argopuro is the tallest hill, which is near the Yang upland. The climber will pick of Argopuro’s cold wind that blows friendly. Each climber will admire it. The climber will find other interesting places that need to be visited. After visit the peak of Argopuro or “Rengganis Palace”, try to back to accentor to continue the traveling to “Si Kasur”. Going around Batu Lempeng hill, going down of Pondok Celot (Celot hut), through Taman Sarang Laba-laba (Spider’s web garden) which known as “Si Mesem” (the smile). In this location, the visitor will smile, to admire the nature miracle. Everywhere, we can find the Spider’s web and the grass plain that is largely like mattress, so this place is called “Si Kasur” (the mattress). Fresh vegetables are provided to one whom camp in this place.